The Lipizzan, or Lipizzaner (Croatian: Lipicanac, Czech: Lipicán, Hungarian: Lipicai, Italian: Lipizzano, Slovene: Lipicanec), is a breed of horse originating from Lipica in Slovenia. Established in 1580, the Lipica stud farm is the world's oldest continuously operating stud farm. It is also closely associated with the Spanish Riding School of Vienna, Austria, where they demonstrate the haute école or "high school" movements of classical dressage, including the highly controlled, stylized jumps and other movements known as the "airs above the ground." The horses at the Spanish Riding School are trained using traditional methods that date back hundreds of years, based on the principles of classical dressage. Developed by the House of Habsburg from Arab, Barb, Spanish and Neapolitan stock. Today associated with nations of Slovenia, Austria, Croatia and Hungary. The Lipizzan breed dates back to the 16th century, when it was developed with the support of the Habsburg nobility. The breed takes its name from one of the earliest stud farms established, located near the village of Lipica (spelled "Lipizza" in Italian), in modern-day Slovenia. The breed has been endangered numerous times by warfare sweeping Europe, including during the War of the First Coalition, World War I, and World War II. The rescue of the Lipizzans during World War II by American troops was made famous by the Disney movie Miracle of the White Stallions. The breed has also starred or played supporting roles in many movies, TV shows, books, and other media. Today, eight stallions are recognized as the foundation bloodstock of the breed, all foaled the late 18th and early 19th centuries. All modern Lipizzans trace their bloodlines to these eight stallions, and all breeding stallions have included in their name the name of the foundation sire of their bloodline. Also classic mare lines are known, with up to 35 recognized by various breed registries. The majority of horses are registered through the member organizations of the Lipizzan International Federation, which covers almost 11,000 horses in 19 countries and at 9 state studs in Europe. Most Lipizzans reside in Europe, with smaller numbers in the Americas, Africa, and Australia. Generally gray in color, the Lipizzan is a muscular breed that matures slowly and is long-lived. Most Lipizzans measure between 14.2 and 15.2 hands (58 and 62 inches, 147 and 157 cm). However, horses bred to be closer to the original carriage-horse type are taller, approaching 16.1 hands (65 inches, 165 cm). Lipizzans have a long head, with a straight or slightly convex profile. The jaw is deep, the ears small, the eyes large and expressive, and the nostrils flared. They have a neck that is sturdy, yet arched and withers that are low, muscular, and broad. They are a Baroque horse, with a wide, deep chest, broad croup, and muscular shoulder. The tail is carried high and well set. The legs are well-muscled and strong, with broad joints and well-defined tendons. The feet tend to be small, but are tough. Lipizzan horses tend to mature slowly. However, they live and are active longer than many other breeds, with horses performing the difficult exercises of the Spanish Riding School well into their 20s and living into their 30s. Aside from the rare solid-colored horse (usually bay or black), most Lipizzans are gray. Like all gray horses, they have black skin, dark eyes, and as adult horses, a white hair coat. Gray horses, including Lipizzans, are born with a pigmented coat—in Lipizzans, foals are usually bay or black—and become lighter each year as the graying process takes place, with the process being complete between 6 and 10 years of age. Lipizzans are not actually true white horses, but this is a common misconception. A white horse is born white and has unpigmented skin. Until the 18th century, Lipizzans had other coat colors, including dun, bay, chestnut, black, piebald, and skewbald. However, gray is a dominant gene. Gray was the color preferred by the royal family, so the color was emphasized in breeding practices. Thus, in a small breed population when the color was deliberately selected as a desirable feature, it came to be the color of the overwhelming majority of Lipizzan horses. However, it is a long-standing tradition for the Spanish Riding School to have at least one bay Lipizzan stallion in residence, and this tradition is continued through the present day. The ancestors of the Lipizzan can be traced to around 800 AD. 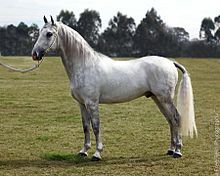 The earliest predecessors of the Lipizzan originated in the seventh century when Barb horses were brought into Spain by the Moors and crossed on native Spanish stock. The result was the Andalusian horse and other Iberian horse breeds. By the 16th century, when the Habsburgs ruled both Spain and Austria, a powerful but agile horse was desired both for military uses and for use in the fashionable and rapidly growing riding schools for the nobility of central Europe. Therefore, in 1562, the Habsburg Emperor Maximillian II brought the Spanish Andalusian horse to Austria and founded the court stud at Kladrub. In 1580, his brother, Archduke Charles II, established a similar stud at Lipizza (now Lipica), located in modern-day Slovenia, from which the breed obtained its name. The name of the village itself derives from the Slovenian word lipa, meaning "linden tree." 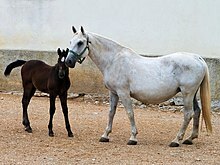 Spanish, Barb, and Arabian stock were crossed at Lipizza, and succeeding generations were crossed with the now-extinct Neapolitan breed from Italy and other Baroque horses of Spanish descent obtained from Germany and Denmark. While breeding stock was exchanged between the two studs, Kladrub specialized in producing heavy carriage horses, while riding and light carriage horses came from the Lipizza stud. Beginning in 1920, the Piber Federal Stud, near Graz, Austria, became the main stud for the horses used in Vienna. Breeding became very selective, only allowing stallions that had proved themselves at the Riding School to stand at stud, and only breeding mares that had passed rigorous performance testing. 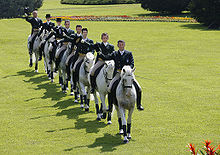 Today, eight foundation lines for Lipizzans are recognized by various registries, which refer to them as "dynasties". They are divided into two groups. Six trace to classical foundation stallions used in the 18th and 19th centuries by the Lipizza stud, and two additional lines were not used at Lipizza, but were used by other studs within the historic boundaries of the Habsburg Empire. Tulipan: A black stallion of Baroque type and Spanish pedigree foaled about 1800 from the Croatian stud farm of Terezovac, owned by Count Janković-Bésán. Several other stallion lines have died out over the years, but were used in the early breeding of the horses. In addition to the foundation stallion lines, there were 20 "classic" mare lines, 14 of which exist today. However, up to 35 mare lines are recognized by various Lipizzan organizations. Traditional naming patterns are used for both stallions and mares, required by Lipizzan breed registries. Stallions traditionally are given two names, with the first being the line of the sire and the second being the name of the dam. For example, "Maestoso Austria" is a horse sired by Maestoso Trompeta out of a mare named Austria. The horse's sire line traces to the foundation sire Maestoso. The names of mares are chosen to be "complementary to the traditional Lipizzan line names" and are required to end in the letter "a". The world-famous Spanish Riding School uses highly trained Lipizzan stallions in public performances that demonstrate classical dressage movements and training. In 1572, the first Spanish riding hall was built, during the Austrian Empire, and is the oldest of its kind in the world. 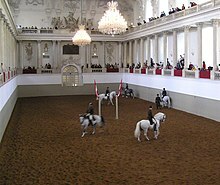 The Spanish Riding School, though located in Vienna, Austria, takes its name from the original Spanish heritage of its horses. In 1729, Charles VI commissioned the building of the Winter Riding School in Vienna and in 1735, the building was completed that remains the home of the Spanish Riding School today. The Lipizzans endured several wartime relocations throughout their history, each of which saved the breed from extinction. The first was in March 1797 during the War of the First Coalition, when the horses were evacuated from Lipica. During the journey, 16 mares gave birth to foals. In November 1797, the horses returned to Lipica, but the stables were in ruins. They were rebuilt, but in 1805, the horses were evacuated again when Napoleon invaded Austria. They remained away from the stud for two years, returning April 1, 1807, but then, following the Treaty of Schönbrunn in 1809, the horses were evacuated three more times during the unsettled period that followed, resulting in the loss of many horses and the destruction of the written studbooks that documented bloodlines of horses prior to 1700. The horses finally returned to Lipica for good in 1815, where they remained for the rest of the 19th century. The first evacuation of the 20th century occurred in 1915 when the horses were evacuated from Lipica due to World War I and placed at Laxenburg and Kladrub. Following the war, the Austro-Hungarian Empire was broken up, with Lipica becoming part of Italy. Thus, the animals were divided between several different studs in the new postwar nations of Austria, Italy, Hungary, Czechoslovakia, Romania, and Yugoslavia. The nation of Austria kept the stallions of the Spanish Riding School and some breeding stock. By 1920, the Austrian breeding stock was consolidated at Piber. During World War II, the high command of Nazi Germany transferred most of Europe's Lipizzan breeding stock to Hostau, Czechoslovakia. The breeding stock was taken from Piber in 1942, and additional mares and foals from other European nations arrived in 1943. The stallions of the Spanish Riding School were evacuated to St. Martins, Austria, from Vienna in January 1945, when bombing raids neared the city and the head of the Spanish Riding School, Colonel Alois Podhajsky, feared the horses were in danger. By spring of 1945, the horses at Hostau were threatened by the advancing Soviet army, which might have slaughtered the animals for horse meat had it captured the facility. The rescue of the Lipizzans by the United States Army, made famous by the Disney movie Miracle of the White Stallions, occurred in two parts: The United States Third Army, under the command of General George S. Patton, was near St. Martins in the spring of 1945 and learned that the Lipizzan stallions were in the area. Patton himself was a horseman, and like Podhajsky, had competed in the Olympic Games. On May 7, 1945, Podhajsky put on an exhibition of the Spanish Riding School stallions for Patton and Undersecretary of War Robert P. Patterson, and at its conclusion requested that Patton take the horses under his protection. Meanwhile, the Third Army's United States Second Cavalry, a tank unit under the command of Colonel Charles Reed, had discovered the horses at Hostau, where 400 Allied prisoners of war were also being kept, and had occupied it on April 28, 1945. "Operation Cowboy", as the rescue was known, resulted in the recovery of 1,200 horses, including 375 Lipizzans. Patton learned of the raid, and arranged for Podhajsky to fly to Hostau. On May 12, American soldiers began riding, trucking, and herding the horses 35 miles across the border into Kotztinz, Germany. 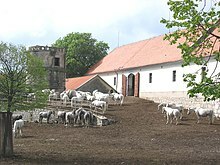 The Lipizzans were eventually settled in temporary quarters in Wimsbach, until the breeding stock returned to Piber in 1952, and the stallions returned to the Spanish Riding School in 1955. In 2005, the Spanish Riding School celebrated the 60th anniversary of Patton's rescue by touring the United States. During the Croatian War of Independence, from 1991 to 1995, the horses at the Lipik stable in Croatia were taken by the Serbs to Novi Sad, Serbia. The horses remained there until 2007, when calls began to be made for them to be returned to their country of origin. In October 2007, 60 horses were returned to Croatia. The Lipizzan breed suffered a setback to its population when a viral epidemic hit the Piber Stud in 1983. Forty horses and 8% of the expected foal crop were lost. Since then, the population at the stud increased. By 1994, 100 mares were at the stud with and a foal crop of 56 was born in 1993. In 1994, the rate of successful pregnancy and birth of foals increased from 27 to 82% as the result of a new veterinary center. In 1996, a study funded by the European Union Indo-Copernicus Project assessed 586 Lipizzan horses from eight stud farms in Europe, with the goal of developing a "scientifically based description of the Lipizzan horse". A study of the mitochondrial DNA (mtDNA) was performed on 212 of the animals, and those studied were found to contain 37 of the 39 known mtDNA haplotypes known in modern horses, meaning that they show a high degree of genetic diversity. This had been expected, as it was known that the mare families of the Lipizzan included a large number of different breeds, including Arabians, Thoroughbreds, and other European breeds. The Lipizzan International Federation (LIF) is the international governing organization for the breed, composed of many national and private organizations representing the Lipizzan. The organizations work together under the banner of the LIF to promote the breed and maintain standards. As of 2012, almost 11,000 Lipizzans were registered with the LIF residing with private breeders in 19 countries and at 9 state studs in Europe. The largest number are in Europe, with almost 9,000 registered horses, followed by the Americas, with just over 1,700, then Africa and Australia with around 100 horses each. The 9 state studs that are part of the LIF represent almost one-quarter of the horses in Europe. Sâmbăta de Jos, in Romania, has the greatest number of horses, with 400, followed by Piber in Austria (360), Lipica in Slovenia (358), Szilvásvárad in Hungary (262), Monterotondo in Italy (230), Đakovo-Lipik in Croatia (220), and Topoľčianky in Slovakia (200). The other two studs are smaller, with Vučijak in Bosnia having 130 horses and Karađorđevo in Serbia having just 30. Educational programs have been developed to promote the breed and foster adherence to traditional breeding objectives. Because of the status of Lipizzans as the only breed of horse developed in Slovenia, via the Lipica stud that is now located within its borders, Lipizzans are recognized in Slovenia as a national animal. For example, a pair of Lipizzans is featured on the 20-cent Slovenian euro coins. Mounted regiments of Carabinieri police in Italy also employ the Lipizzan as one of their mounts. In October 2008, during a visit to Slovenia, a Lipizzan at Lipica, named 085 Favory Canissa XXII, was given to Queen Elizabeth II of the United Kingdom. She decided to leave the animal in the care of the stud farm. The traditional horse training methods for Lipizzans were developed at the Spanish Riding School and are based on the principles of classical dressage, which in turn traces to the Ancient Greek writer Xenophon, whose works were rediscovered in the 16th century. His thoughts on development of horses' mental attitude and psyche are still considered applicable today. Other writers who strongly influenced the training methods of the Spanish Riding School include Federico Grisone, the founder of the first riding academy in Naples, who lived during the 16th century, and Antoine de Pluvinel and François Robichon de la Guérinière, two Frenchmen from the 17th and 18th centuries. The methods for training the Lipizzan stallions at the Spanish Riding School were passed down via an oral tradition until Field Marshal Franz Holbein and Johann Meixner, Senior Rider at the School, published the initial guidelines for the training of horse and rider at the school in 1898. In the mid-20th century, Alois Podhajsky wrote a number of works that serve as textbooks for many dressage riders today. Forward riding, also called straight riding or the Remontenschule, is the name given to the skills taught in the first year of training, where a young horse learns to be saddled and bridled, learns basic commands on a longe line, and then is taught to be ridden, mostly in an arena in simple straight lines and turns, to teach correct responses to the rider's legs and hands while mounted. The main goal during this time is to develop free forward movement in as natural a position as possible. Campaign school, Campagneschule or Campagne, is where the horse learns collection and balance through all gaits, turns, and maneuvers. The horse learns to shorten and lengthen his stride and perform lateral movements to the side, and is introduced to the more complex double bridle. This is the longest training phase and may take several years. High-school dressage, the haute école or Hohe Schule, includes riding the horse with greater collection with increased use of the hindquarters, developing increased regularity, skill, and finesse in all natural gaits. In this period, the horse learns the most advanced movements such as the half-pass, counter-canter, flying change, pirouette, passage, and piaffe. This is also when the horse may be taught the "airs above the ground." This level emphasizes performance with a high degree of perfection. Although the Piber Stud trains mares for driving and under saddle, the Spanish Riding School exclusively uses stallions in its performances. Worldwide, the Lipizzan today competes in dressage and driving, as well as retaining their classic position at the Spanish Riding School. The levade is a position wherein the horse raises up both front legs, standing at a 30° angle entirely on its hind legs in a controlled form that requires a great deal of hindquarter strength. A less difficult but related movement is the pesade, where the horse rises up to a 45° angle. The courbette is a movement where the horse balances on its hind legs and then essentially "hops", jumping with the front legs off the ground and hind legs together. The capriole is a jump in place where the stallion leaps into the air, tucking his forelegs under himself, and kicks out with his hind legs at the top of the jump. The croupade and ballotade are predecessors to the capriole. In the croupade, the horse jumps with both front and hind legs remaining tucked under the body and he does not kick out. 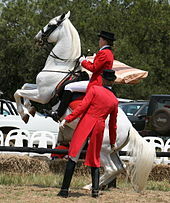 In the ballotade, the horse jumps and untucks his hind legs slightly, he does not kick out, but the soles of the hind feet are visible if viewed from the rear. The mezair is a series of successive levades in which the horse lowers its forefeet to the ground before rising again on hindquarters, achieving forward motion. This movement is no longer used at the Spanish Riding School. Lipizzans have starred or played supporting roles in many movies, TV shows, books, and other media. The 1940 film Florian stars two Lipizzan stallions. It was based on a 1934 novel written by Felix Salten. The wife of the film's producer owned the only Lipizzans in the US at the time the movie was made. The rescue during World War II of the Lipizzan stallions is depicted in the 1963 Walt Disney movie Miracle of the White Stallions. The movie was the only live-action, relatively realistic film set against a World War II backdrop that Disney has ever produced. In the feature film Crimson Tide, a discussion between the two main characters over whether Lipizzans came from Spain or Portugal, and whether they are born white or black, is used to represent the film's suppressed racial conflict and the dividing of the world between two main powers during the Cold War. Television programs featuring the Lipizzans include The White Horses, a 1965 children's television series co-produced by RTV Ljubljana (now RTV Slovenija) of Yugoslavia and BR-TV of Germany, rebroadcast in the United Kingdom. It followed the adventures of a teenaged girl who visits a farm where Lipizzan horses are raised. Many books and poems mention or star Lipizzans. In 2011, the Dutch writer Frank Westerman published a book on the history of the 20th century through the perspective of the Lipizzan horses, Brother Mendel's Perfect Horse. In the 2004 novel The Star of Kazan by Eva Ibbotson, Lipizzan horses and the Spanish Riding School are key elements of both the plot and the setting. Lipizzans and the Spanish Riding School also play a crucial role in Mary Stewart's 1965 novel Airs Above the Ground and Marguerite Henry's 1964 children's novel White Stallion of Lipizza. In the 1960s, the Slovene poet Edvard Kocbek wrote a poem dedicated to the Lipizzan horses. On June 21, 2011 Annie Wedekind released "Mercury's Flight: The Story of a Lipizzaner Stallion" through Breyer Horses as part of The Breyer Horse Collection book series. In a first season episode of The Angry Beavers, "Fancy Prance" Norbert confesses to Daggett that his lifelong dream is to become a Lipizzaner stallion. Former concert promoter Gary Lashinsky owned the World Famous Lipizzaner Stallions until they filed for chapter 7 bankruptcy and permanently closed. A new movie based on the World War II evacuation of Lipizzaners from a Nazi breeding farm was expected to hit theaters in December 2016. ^ a b c d e f g h i j k l m n "Lipizzan Origins". Lipizzan Association of North America. Retrieved 2008-09-17. ^ a b Edwards, The Encyclopedia of the Horse, p.111. ^ Bongianni, Simon & Schuster's Guide to Horses and Ponies, Entry 37. ^ a b "Introduction to Coat Color Genetics". Veterinary Genetics Laboratory. University of California, Davis. Retrieved 2008-09-19. ^ "Lipizzaner". Breeds of Livestock. Oklahoma State University. Archived from the original on 2008-09-24. Retrieved 2008-09-19. ^ Swinney, Horse Breeds of the World, p.52. ^ "The Lipizzaner". Equiworld. Archived from the original on 2008-04-30. Retrieved 2008-09-17. ^ "Andalusian". Breeds of Livestock. Oklahoma State University. Archived from the original on 2009-04-10. Retrieved 2008-11-05. ^ Snoj, Marko (2009). Etimološki slovar slovenskih zemljepisnih imen. Modrijan and Založba ZRC. pp. 234–235. ^ "The Lipizzan Horses". Piber Stud. Archived from the original on 2007-09-28. Retrieved 2008-09-17. ^ a b "Breed Standards". Lipizzan International Federation. Retrieved 2014-04-29. ^ a b c d "Sire Lines". Lipizzan International Federation. Retrieved 2014-04-29. ^ "Lipizzans". Classical Dressage. Ritter Dressage. Archived from the original on 2013-01-19. Retrieved 2008-09-19. ^ "Rules/Evaluations". Lipizzan Association of North America. Retrieved 2008-09-17. ^ a b c d e f "The Stallions". Spanish Riding School. Archived from the original on 2012-03-29. Retrieved 2012-03-16. ^ a b "The Spanish Riding School". Spanish Riding School. Archived from the original on 2012-03-18. Retrieved 2012-03-16. ^ "Lipizzan Horse History". Lipizzan International Federation. Archived from the original on 2011-07-10. Retrieved 2008-11-19. ^ a b c d "Lipizzan Breed History". United States Lipizzan Registry. Retrieved 2008-12-06. ^ a b c "History". Piber Stud. Archived from the original on 2011-09-29. Retrieved 2011-12-08. ^ a b c d Davis, Susan (October 16, 1995). "Operation Cowboy". Sports Illustrated. Retrieved 2008-12-08. ^ a b Sosby, Brian (October 2005). "The 2005 Lipizzaner Tour of the Spanish Riding School" (PDF). Equestrian. Retrieved 2008-11-24. ^ Letts, Elizabeth. 2016. The Perfect Horse: The Daring U.S. Mission to Rescue the Priceless Stallions Kidnapped by the Nazis. ^ "The History". Spanish Riding School. Archived from the original on 2011-01-05. Retrieved 2011-12-08. ^ "After 15 Year Absence Legendary Lipizzaner Stallions of the Spanish Riding School of Vienna Set Return for U.S. Tour". Business Wire. 2005-05-05. Archived from the original on 2009-02-11. Retrieved 2008-09-19. ^ Boris Orešić (2010-12-28). "Pomor u zajednici bijelih griva - I Lipicance ubijaju, zar ne?". Globus (in Croatian). Archived from the original on 2011-01-01. ^ "Croatian Lipizzaners Return Home". Lipizzan Association of North America. Retrieved 2014-04-29. ^ a b Kelly, Jeff & Kelly-Simmons, Lisa (Winter 2012). "Mitochondrial DNA Genetics of Lipizzans" (PDF). USLF News. Archived from the original (PDF) on 2014-04-27. ^ Kavar, Tatjana; Brem, Gottfried; Habe, Franc; Sölkner, Johann; Dovč, Peter (2002). "History of Lipizzan horse maternal lines as revealed by mtDNA analysis" (PDF). Genet. Sel. Evol. 34 (5): 635–648. doi:10.1051/gse:2002028. PMC 2705438. PMID 12427390. ^ "Gründung" (in German). Lipizzan International Federation. Retrieved 2014-04-26. ^ Manz, Christian G.M. (October 2012). "Purebred Lipizzans Registered by Members of Lipizzan International Federation". Lipizzan International Federation. Retrieved 2014-04-28. ^ Manske, Michael. "Slovenia Banks on the Euro". Network Europe. Archived from the original on 2008-05-03. Retrieved 2008-09-24. ^ Vukic, Snjezana (2008-10-22). "Slovenia Gives Britain's Queen a Lipizzaner Horse". USA Today. Associated Press. Retrieved 2011-12-08. ^ Gibbon, Abby (September 29, 2011). "Xenophon, Forefather Of Dressage". Chronicle of the Horse. Retrieved 2014-04-22. ^ "Classical Equitation". Spanish Riding School. Archived from the original on 2006-05-22. Retrieved 2009-01-07. ^ "Florian". Lipizzan Association of North America. Retrieved 2008-09-17. ^ Brode, From Walt to Woodstock, p.169. ^ Huber, Christoph; Peranson, Mark. "World Out of Order: Tony Scott's Vertigo". Cinema Scope. Archived from the original on 2009-02-11. Retrieved 2008-09-18. ^ Marcus, Laurence (2007). "The White Horses". Television Heaven. Retrieved 2014-04-29. ^ Shilling, Jane (2012-08-07). "Brother Mendel's Perfect Horse by Frank Westerman: review". The Daily Telegraph. London. ^ Trelease, Jim. "The Treasury of Read-Alouds". The Read-Aloud Handbook. Reading Tree Productions. Retrieved 2008-09-18. ^ "Airs Above the Ground". Mary Stewart. Retrieved 2008-09-18. ^ "The Lipizzaner". Poetry International. Retrieved 2014-04-22. Brode, Douglas (2004). From Walt to Woodstock: How Disney Created the Counterculture. University of Texas Press. ISBN 978-0-292-70273-8. Dolenc, Milan (translated by Zarco Harvat and Susan Ann Pechy) (1981). Lipizzaner: The Story of the Horses of Lipica. Ljubljana, Yugoslavia: Mladinska Knjiga. ISBN 978-0-89893-172-3. Edwards, Elwyn Hartley (1994). The Encyclopedia of the Horse (1st American ed.). New York, NY: Dorling Kindersley. ISBN 978-1-56458-614-8. Helbig, Alethea & Perkins, Agnes (1986). Dictionary of American children's fiction, 1960-1984: recent books of recognized merit. Volume 2, Dictionary of American children's fiction. Greenwood Publishing Group. ISBN 978-0-313-25233-4. Hirshson, Stanley P. (2003). General Patton: A Soldier's Life. HarperCollins. ISBN 978-0-06-000983-0. Patton, George S. & Martin Blumenson (1996). The Patton Papers. Da Capo Press. ISBN 978-0-306-80717-6. Swinney, Nicola Jane & Bob Langris (2006). Horse Breeds of the World. Globe Pequot. ISBN 978-1-59228-990-5. Wikimedia Commons has media related to Lipizzaner.